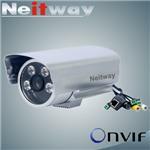 NNF-9135HD series IP Cameras are 1080P 2.1 megapixel high definition outdoor waterproof HD IR box IP cameras, it use 1/3" Progressive Scan CMOS sensor and advanced H.264 codec, it support various definition like 1920*1080 and dual streaming.It built-in fixed focus lens and 4 big infrared LED lights, support day/night auto converting. It own audio, alarm, RJ45, SD card, WiFi and so on interfaces. This camera use perfect waterproof housing which meet IP66, it''s suitable to use for outdoor or indoor surveillance scene without low light. It can be used to various industies like port, trafic, shool, building, and bank. It support FTP, RTSP, DDNS, PPPoE, DHCP, SMTP, POP3, VPN, DDNS and so on network protocols. It support ONVIF (Open network video interfaces form) standard, it''s easy to compatible with other third-party video management software.
? 1/3" 2.0 Megapixel Progressive Scan CMOS sensor.
? Support Color/BW mode converting (dual IR-Cut filter).
? Built-in 5-15mm varifocal lens.
? 4 pieces high power infrared LED light, the distance up to 30 meters.
? H.264/MJEG is optional, dual streaming, low bandwidth, and high quality.
? Support AWB, natural color, clear image.
? Build in 1 channel audio input and audio output ports, support realtime audio capture and two-way talking.
? Built-in SD card slot, support SDHC card.
? Water and Dust Resistance: IP66.
? Support 802.11b/g Wireless protocols、supports WEP,WPA,WPA2("-w" model supports).
? Support pravicy zone mask (max 4 individal mask zone).
? Alarm recording: video lost, motion detection and sensor alarm.
? Built-in Web server enables the use of a standard Web browser for viewing and management.